The food pyramid presented here is the graphics of the pyramid presented at the Third International Conference CIISCAM, The International Center for Interuniversity Research on the Culture of the Mediterranean Food (http://www.ciiscam.org/) in collaboration with the INRAN (http://www.inran.it/) held in Parma November 3, 2009. 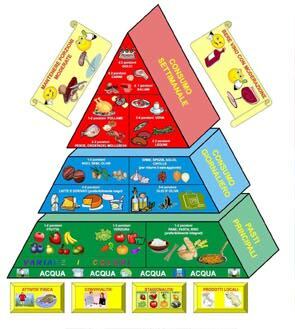 Pyramid is divided in three parts: food on the base is recommended for consumption with high frequency during any meal. At the top food to be consumed with moderation during the week, as sweets, red meat. At the center are those that must be consumed every day. Prefer milk and dairy products and herbs and spices instead of the fat dressings; please change color and variety for vegetables and fruits. Better whole-grain cereals. At the base of the pyramid, the suggestion of drinking Water in abundance. This concept is related to an appropriate Food Culture. Please diet goes together with physical activity. Prefer season products. Conviviality is also important.